Just a couple of council by-elections this week. 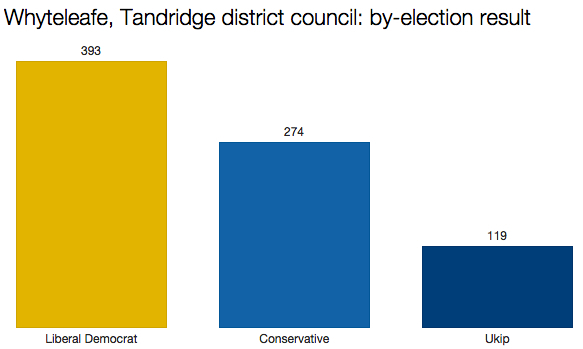 The result represented a mighty 15.3% swing from the Tories to the Lib Dems, whose fortunes may have been boosted by there being no Labour or Green candidate standing. But the outcome won’t have the slightest bearing on the result at the general election for the constituency in which the by-election took place. Surrey East is an ultra-safe Tory seat, where Sam Gyimah won a majority of 16,874 in 2010. There was another big swing here, totalling 13.2% from Plaid to Labour. 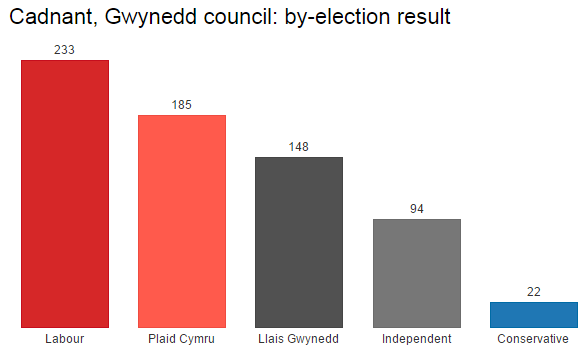 The seat is in the constituency of Arfon, which Labour is hoping to take from Plaid in the general election and which would change hands on a swing of just 2.8%. Conservatives losing votes to both left and right in Whyteleafe- UKIP vote up 3% but this was not decisive as LDs achieved higher swing.